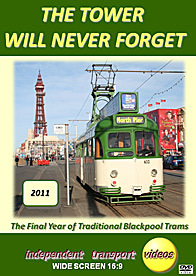 By 2011 traditional trams have operated in Blackpool for 126 years. They have always been a familiar sight running along the promenade and past the world famous Blackpool Tower. At Easter 2012 a new fleet of Flexity2 trams start operating in place of the traditional tramcars we have grown to love. There will still be some of the existing trams operating, having been modified to suit the new system with new doors and other features. At certain times of the year some historic trams will also still operate. So 2011 was the final year of the old order. Over the last few years there has been a good deal of reconstruction along the promenade to accommodate the new trams, and a lot of this is in evidence on the programme. During April trams were only operating from the Pleasure Beach to North Pier. By November this had been extended to Little Bispham. Our cameras made three visits to Blackpool during 2011 to capture the action and record it for posterity. The first visit was on Easter Monday, 25th April 2011 where we capture the action along the Promenade, North Pier and at the Pleasure Beach. ‘Balloons’ 711, 715, 717, 719 and 723 are seen in service alongside ‘Centenary’ cars 646 & 648 as well as ‘Boat’ 600 and Jubilee car 762. Our next visit is on the 17th August 2011 where we see all double deckers in action! Trams 709, 711, 713, 715, 718 & 719 are seen along the Promenade together with Jubilee cars 761 & 762. Our third visit is over the weekend of 4th & 5th November 2011. It was the last weekend for the Blackpool Illuminations, and the final weekend of the traditional tram service before it closes for the winter. Filming locations are along the promenade, North Pier, Pleasure Beach, Manchester Square, Bispham and at the Rigby Road tram depot. We also take rides on Railcoach 632, Centenary 644, Millennium 718 and Jubilee 761. We film during the day and night recording plenty of action. Our final scenes are as the trams arrive in Rigby Road tram depot from service close to midnight on the 5th November. This marks the end of another chapter of tramway history in the United Kingdom. Next Easter a new one will begin...................................but THE TOWER WILL NEVER FORGET.